You don't need to be a fan of archaeology to love celebrating the mighty fossils of yonder yore. Now you can use these custom cookie cutters to bring some extra pizzazz to your fancy Gala, or just a casual party for any kiddo who loves those creatures of mass destruction from the Jurassic era. 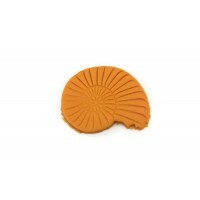 3D Printed Ammonite Fossil Cookie Cutter 2 1/2" x 2"